Man impressive work to be made inside Darkradiant! But i still think you would gain more by going to a full 3D modeling program, if Blender is too strange for you, you can try Wings3D, is also free and much much easier to work with compared to blender of course, it also makes closed models automatically, recommended for the stencil shadows system, btw it was the tool i started with now i use Luxology Modo. Edited by HMart, 07 May 2015 - 07:54 PM. @Hmart, what model export options does it support, we need .LWO or .ASE. And it runs on linux, looks worth checking out. Speaking on the topic of what gets added to the core mod how does that process work? is it upto just whoever places the models in the SVN or do you guys discuss things behind the scenes? or is it just one person deciding what they think should be added or not? Ultimately I'm supposed to be in charge of what art assets get added, though in practice we usually add anything that a number of people speak up for (unless it has technical issues or doesn't fit the setting). Though I'm finding as time goes on my standards for what is good enough quality are going up. There are things that were added years ago, sometimes with public support and sometimes not, that now make me cringe when I see them. We've really got to get you a modelling program. You're definitely right, it looked great when I watched some modelling timelapses on Youtube earlier today. People were modelling very fancy fantasy swords in no time, sometimes just by tracing the outlines from a picture and then pasting the picture on as a texture (like this one). What I was thinking until not so long ago was that I had all these little methods for using patches to make something where I needed it in my map, but in the long term Blender and Wings3D are much more capable tools. They're not really too strange HMart (thanks for suggesting this program also), just a hurdle to get familiar with the other way of doing things. It's the same thing in the "TTLG: they still need reminding" thread about getting DromEd authors from Thief to try out DarkRadiant more often. Edited by Dragofer, 08 May 2015 - 03:40 PM. Wings3D saves .lwo files directly so you are good to go. The single bulbs come with 704 tris, the double bulbs are 1180 tris. They come with straight or curved gas pipes. If you look very closely, you'll see Blender up at the top I tried Blender first to figure out if it would make more sense to use Wings3D, but it worked very well after I sat through Youtube tutorials on how to select and manipulate things. I'd even choose Blender over patches now. Here's another: one of the first things I did was to recreate my patchwork oil lamp as an .lwo. That was great because it got rid of the starry lines that were in the old patch one. This one is 586 polys. 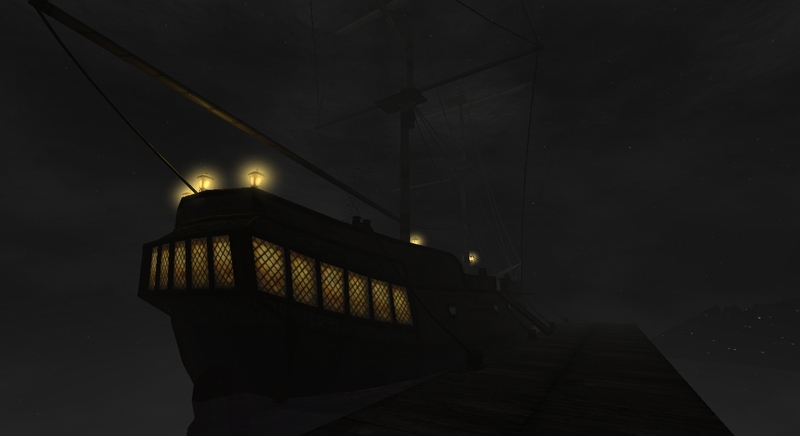 And, with some bugfixes, the sloop is now game-ready. The structure itself is around 9500 tris plus some .ase models like bullseyes and mooring pins (bollards). You can climb up the mooring ropes from the pier as an extra way to get onboard, and inside you'll find a relatively spacious captain's cabin and hold. Edited by Dragofer, 29 June 2017 - 10:17 AM. If models arent smooth it is probably exporter problem. Maybe try different one. Sloop looks fantastic. Cant wait to see some ports with those ships. Thanks for the lights! They look awesome. They look lovely, great work! What's up with the black lamps on the right of the first pic? I don't see how no-self-shadows could cause that. They have specular lighting only by the look of it, no diffuse lighting and they're not transparent. If you have trouble debugging it could you post the material decl? Those look great and I appreciate that you're using existing textures. Not only does that help us avoid bloat and make for easier skins, it also helps create a unity in our artistic palette. 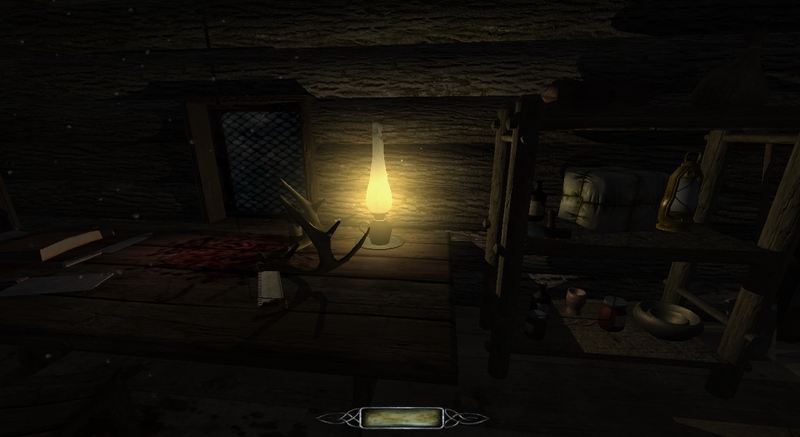 I'm really glad to see the positive reception to Dragofer's lamps! I should emphasise that these are conceptualised as gaslights, and not as electric - just in case anyone may have missed that point - so their entity class properties should reflect that fact if they are going to be added to 'Core' TDM. I will be showing these lamps off in my upcoming WIP screenshots - so look out for them when the pictures are (eventually) uploaded! There are two possible causes to the smoothing issue; vertex smoothing or disconnected polygons. Make sure shading is set to smooth on a per object basis and try removing doubles to merge any overlapping vertices. Outside of that if the shading issues persist than it has to be a problem with exporting. 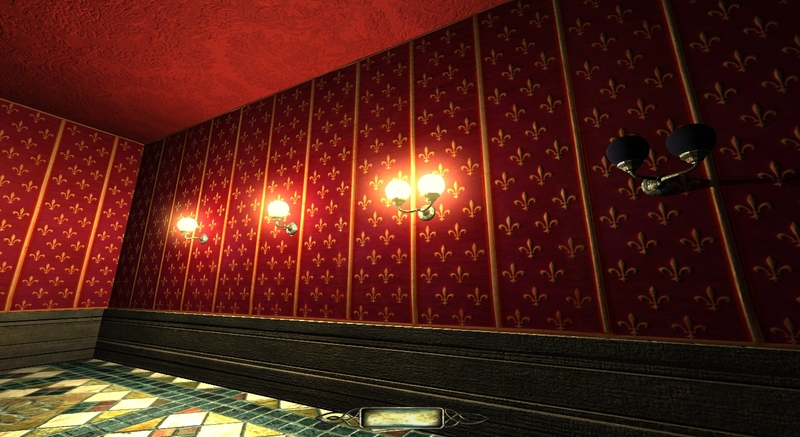 That's the unmodified unlit opaque texture for those lightbulbs, which doesn't have a diffuse map. A better look I think would be to change the unlit texture so that it has a dim white colour, which I think could be done just by tweaking the material. Maybe with a blend line to increase the light intensity, but I'm not very familiar with texture definitions yet. By the way, I figured out what caused the pure black textures ingame - my custom materials file was in darkmod/materials/custom, when it should've been simply in darkmod/materials. Now that this issue is sorted out it's possible for me to make noshadows skins for the lamp metal when they're lit, and to turn the stagecoach into a single .ase model where all the details use noshadows textures. My guess is the stagecoach would fit best in the models/darkmod/misc folder? I've tried a second .lwo exporter by Paleajed / EWOC which didn't smooth anything but it showed that the first exporter did actually smooth the bulbs and all of the oil lamp. There has to be something with how I made the metal base, but the shading was still flat after I removed the double verts and manually set vertex smoothing (edit mode -> mesh -> faces -> shade smooth). Maybe there's a third .lwo exporter, or an .ase exporter that works with this Blender version. There isn't much choice at this moment so it's good you say that Some excellent textures really can be used a lot more, like that teapot one, and in general there are a lot of great textures there already. In Thief 2 custom textures are very sought after because they're much sharper than the originals, but in TDM that doesn't seem to be needed. Still, learning GIMP is definitely on my todo list. That made me wonder how you could make them so you can tell they're gaslights. An electric light would make a buzzing sound, have very harsh light and give a constant level of light or keep zapping on and off if it's broken. 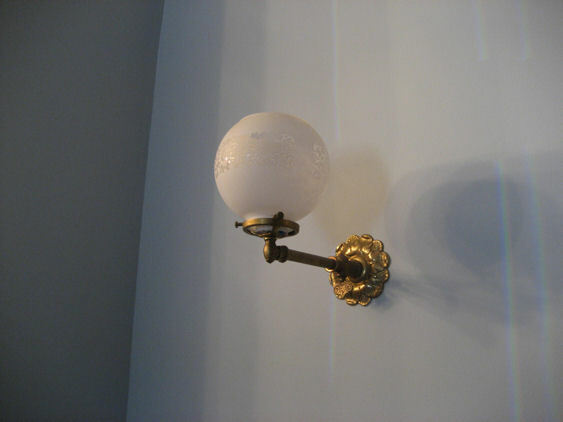 While a gaslight would flicker and maybe need a vent to allow the fumes to escape. They both wouldn't react to water because of the glass spheres. The way they're set up now is closer to the electric lights, but to make them more like gaslights you could use the yellowish _lit skins instead of the white _colorme skins and change the light texture to a moving candleflame's. Edited by Dragofer, 20 May 2015 - 01:19 PM. That made me wonder how you could make them so you can tell they're gaslights. An electric light would make a buzzing sound, have very harsh light and give a constant level of light or keep zapping on and off if it's broken. While a gaslight would flicker and maybe need a vent to allow the fumes to escape. 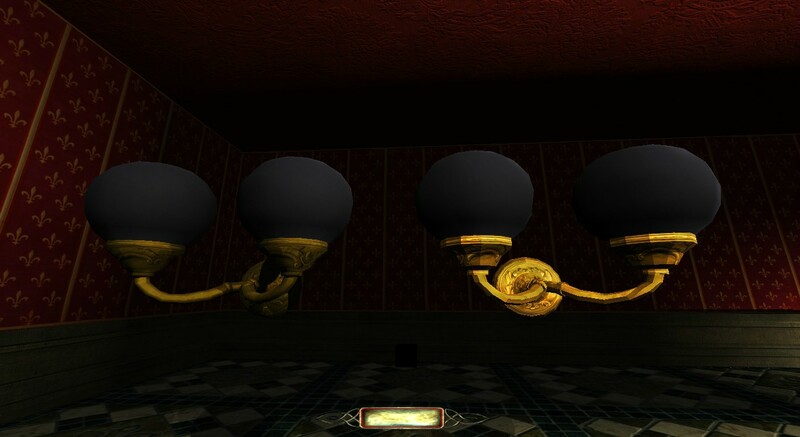 There is actually a s_shader called gaslight which emits a hissing sound, so the gaslight entity should have this in order to signal to the player that it is a gaslight, not an electric one. Small note on this point, the default sound setting is actually quite loud (not dissimilar to real-life gaslights); however, gameplay wise I found that the noise becomes distracting over time, especially if there are multiple lights. To resolve this issue, I changed s_volume to equal 0. As for a vent to allow the fumes to escape - I can imagine that the top of the sphere would have tiny holes in the glass. As these lamps would generally be above player height, I'm not sure that altering the model to include this feature would really be worth it. After all, people can use their imaginations! On the above point, having performed some searching (http://www.ourvictor...Light final.jpg), it appears that there the top of the glass sphere is not actually perfectly round, but is instead has its top removed to allow for ventilation. @Dragofer, having just looked again at the one image I sent you - it does appear that the base of the light (where the sphere rests) has holes cut out, so that the gas can presumably vent from the base. Depending on the gas used, gas will either burn with a blue flame (as seen on kitchen stoves) or alternatively, with a bright white-yellow glow (80/20 ratio). In terms of the light-texture, real-life gaslights barely have any flicker - so a candleflame texture wouldn't really be appropriate. Edited by Dunedain19, 20 May 2015 - 03:07 PM. Can you provide close up of lamp in blender. Problem might be that all lamp is one smooth group. Check from 3:00 forward. I think i read somewhere that it might be a problem. So you add double edges where you want to be sharp. Since you asked how gas lamp should look more like gas lamp. Yellow to orange light and different switch. More valve than a switch. It should also have some openings for air to get in and out. Maybe holes in bottom of lamp. Just dark spots in texture. If you really want to make it perfect. But even now its great. You're exporting to .lwo? Make sure your verts are welded to be properly smoothed. Fantastic work you learned blender really fast! I can't use it for the life of me, after using wings3D then modo for 16 years using Blender to me seems like going back, but that is just me, anyone uses the tool they find the best for him. About the smoothing, you need to know some things, first see if the model has any overlapping edges or vertices if so merge them (is also very bad for the stencil shadows), second cutting the uvmap in to much parts will also divide the models shading, for example if you want a model part to have a single smoothing group, make them part of one single uv island (they need to be connected for this work), you can also apply hard edges or smoothing groups to your mode, to divide the smoothing, but this needs the exporter to support this features, the most supported and safe one is the make one uvmap island trick, you can also cut edges to make them hard but this is not recommended for the TDM engine. Thanks for your support, I've read through the information you posted, and it seems the problem could be related to the textures. This is caused by the game engine not reading the smoothing angle that can be set on the mesh - as with most things to do with game editing it's either all or nothing. As a result the game gets around this problem by using a setting in the material file to apply smoothing. What isn't generally known is why that data is left in the material files, especially when associated with LWO files; the engine reads it as an instruction to apply a general smoothing over an entire model based on material assignment. In other words, if you want your custom LWO model to have smoothing in game you need to add some 'renderbump' information to the material file. I looked through the materials for the textures of some existing .lwo models in TDM and none had this renderbump line in them, so they must have smoothing because of a different mechanism. 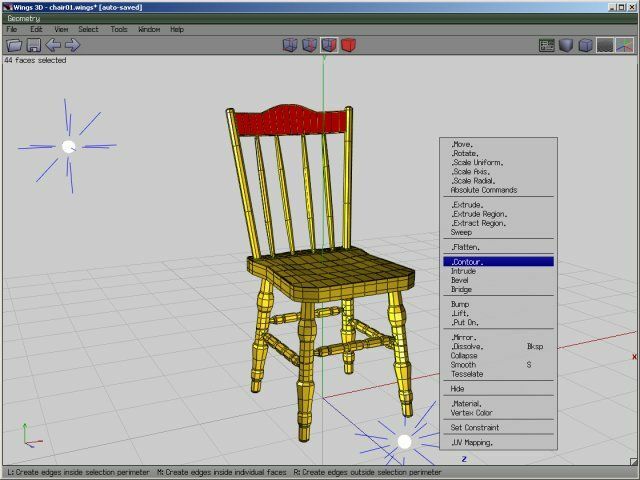 From the forums, renderbump is normally associated with transferring normalmaps from hi-poly to low-poly models. The glass bulb was smooth from the beginning, so in a test I used that texture for the whole model and it was all perfectly smooth. 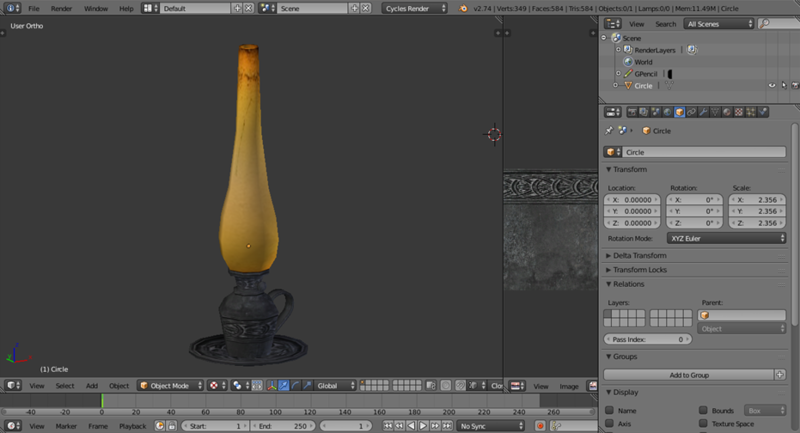 Then I did the opposite test: using only the metal texture for the whole model made even the bulb flat. In another test, I used the generic darkmod/metal/flat/copper_dirty texture, which was flat. Adding renderbump to its material made it smooth. I looked around for exporters and saw that Goldwell uses the same one I do (v1.1 by iPleomax, Post) so it seems it works for TDM, at least back in Blender 2.70. As a test I used the one he uploaded but there was no difference in the smoothing. To test the exporter, I imported a couple existing .lwo models and re-exported them to find that they had no smoothing. The exporter could be broken, but so could the importer, which is also made by iPleomax. Looking at the imported .lwo models, none of them had marked sharp edges or overlapping vertices. Still, I marked sharp edges to separate smoothing groups but that had no effect. Following What are Smoothing Grounps & Mesh Smoothing and forcing it in Blender I intentionally introduced double edges which didn't have any effect. Note that there were no doubled edges or vertices before. I applied the textures from scratch in BlenderRender instead of CyclesRender, which is a different process, but that made no difference. - my exporter and importer can't reproduce existing .lwo models with smoothed surfaces, but the same exporter was used successfully in the past by another TDM member. Edited by Dragofer, 22 May 2015 - 08:33 AM. This makes no sense to me at all. The renderbump stage, so far as I know, is only used for generating normalmap images from a high poly object. It should have no affect whatsoever on the in-game model, and only does something when you use the "renderbump" command from the console. apply a general smoothing over an entire model based on material assignment. Where would the engine get smoothing information from a "material assignment"?? Are these .lwo files available somewhere so I could take a look at them? This is with the copper_dirty and the new copper_dirty_renderbump texture. Thanks for looking into it. Both of these core issues need a work around solution so that Blender 3D created LWO models render correctly in the Doom 3 engine. This tutorial discusses the measures that need to be implemented for both of these problems to allow Blender 3D to export fully functional LWO custom game models. Edited by Dragofer, 22 May 2015 - 09:40 AM. .lwo smooths just fine. It doesn't have smoothing groups like Blender does, but instead has a smoothing value set for each surface type. It works fine in game, but maybe Blender doesn't play well with that method. I have noticed smoothing problems on .ase models in the past that could very easily be solved in LW. I always assumed it was an .ase issue, but perhaps it's actually a Blender one. As for looking at the .lwo files, I'm not sure what's going on, but I get an error when trying to load them. I remember that on modo to have smoothing on idtech 4 you just applied a material smoothing angle of 180º, yes smoothing on modo is material based, don't know how this translates to blender or lightwave the tool Springheel uses. This all sounds like blender .lwo exporter is not doing its job properly.